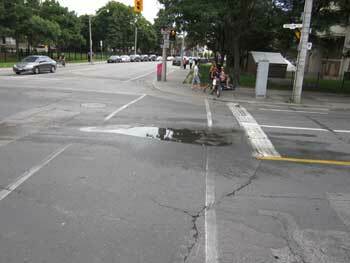 We asked: “The following problem has existed at the intersection of Sherbourne + Shuter, for at least the past 4 months. In the centre of the northbound lane of Sherbourne St, right at the interscetion of Shuter, there is a depression in the pavement, which has been patched several times with ashpalt paving. Even when there has been no rain for a few weeks, this depression in the roadway is filled with water, which suggests that there is very likely a slow, underground leak from a nearby watermain. 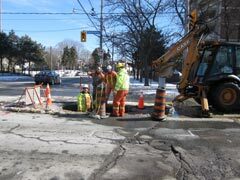 The city ignored Jan 2011 requests from the Toronto Star; the problem was finally fixed March 7. A summary and photo appeared in the April 21 Toronto Star. 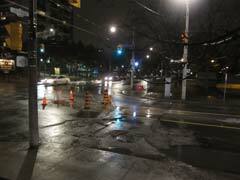 There’s still confusion at Toronto Water over the cause of the icy puddle in the intersection at Sherbourne and Shuter Sts., the subject of our Saturday column. A spokesperson told us Monday the problem was already fixed, the same thing we were told last Friday. We’re sure the water is oozing up from under the street, likely from a leaky water main. … we were told it had been fixed the same day we were there to take photos of it. Hogwash, we said, noting we were there late on the afternoon they said it was fixed. But, but, but … said Catherine Pitt, who deals with media for Toronto Water. No buts, we replied, it is not fixed.